The forecasts are relatively on track this morning from yesterday. 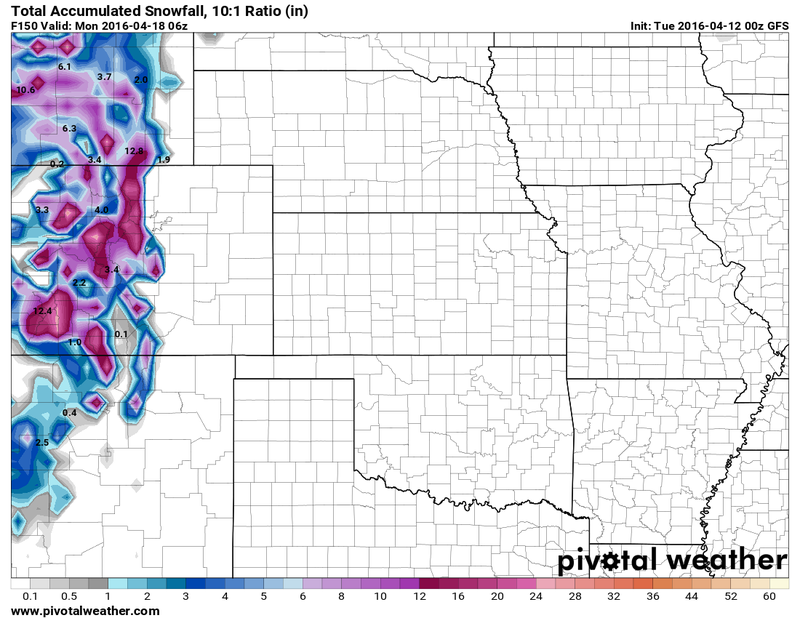 Model agreement that a powerful storm system will move into the Rocky Mountain region is still quite good. There is still quite a bit of disagreement between models as to whether snow or rain falls, temperatures and even the position of where the storm sets up. 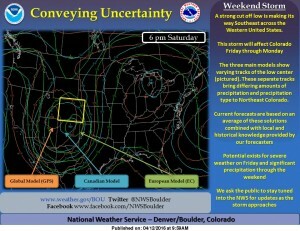 In Colorado, these are all critical to determining what type of storm we get or even if we get a storm at all. We don’t have good weather stations to give us data, so models are really shooting in the dark at this point in time. Without adequate data coming in from observers and station, models really are just giving us a best guess. 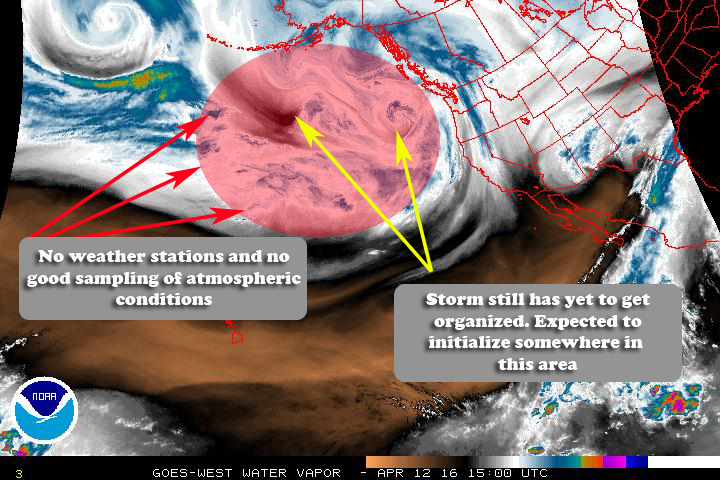 The storm system itself has not even really organized too much. Without seeing how the trough (low pressure) system forms and begins to move, we again don’t have enough data to make good guesses. 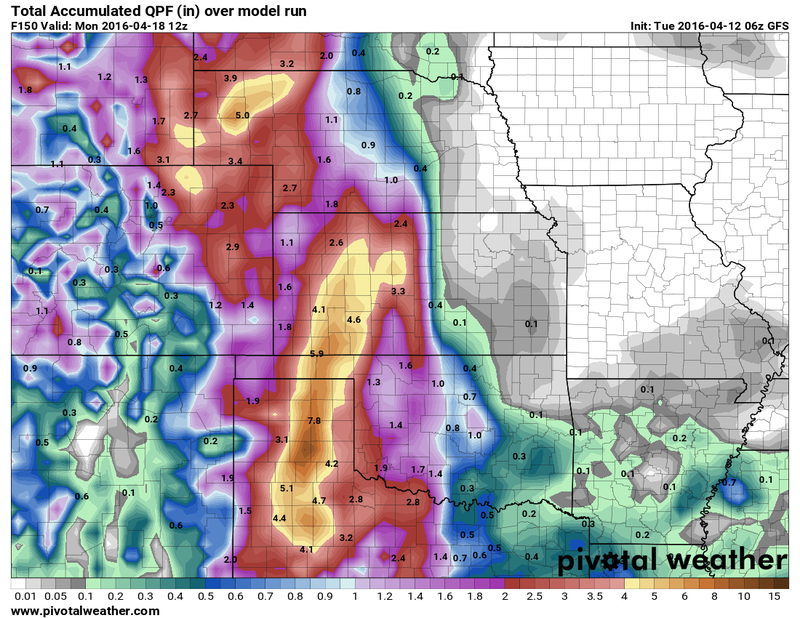 Don’t get me wrong, the accuracy of weather modeling has improved tremendously over the past few years. These programs are great at predicting patterns from even 1-2 weeks out, but the finer details are not usually spotted until much closer to the time the storm arrives. Generally these models get more accurate within the 3-5 day time frame and are best withing 3 days of the storm arriving. We also see a huge jump in accuracy when the storm finally makes it onto land where we can get constant data from weather stations. The Euro however, shows nearly all of this moisture falling as snow. I’ll play devils advocate again, what does this storm look like if the models are predicting exactly what will happen? This is tricky because of the two longer range models don’t agree on rain vs. snow for the storm. So we take an average between the two. Take all of these predictions with a grain of salt though, these are just based on what models show at this time and is in no way meant to be final forecast! There is agreement that the biggest impact looks to be on Sunday from this storm, but the effects will be felt on Saturday and probably Monday as well. From the data I am seeing so far, this storm does not look as windy as the last one that brought big snow and big drifting. This still has plenty of time to change but not looking like blizzard wind conditions at this time. At this point in time, with the storm still several days away from arriving and not even on the coast of the U.S. yet you will probably hear everything from 3 feet of snow to no snow at all from the media and other weather forecasters. One way or another, neither of those predictions are right or wrong. Meteorologists all look at the same data but have different interpretations and instincts. I don’t steal other’s forecasts I make my own; often times I’m right but sometimes I’m wrong. That is the nature of being a meteorologist! The best advice I can give at this time is stay tuned. I don’t expect the forecast to change a whole lot on Tuesday or Wednesday because the storm will still be off shore. We should begin to see model agreement by Thursday which could mean major shifts in the forecast. Stay with us and we will update as new data comes in and we will also have updates should any major changes to the forecast look likely. On another note: thank you to everyone who has followed me that last few days. I’ve enjoyed reading and replying to all your comments and enjoy discussing our awesome Colorado weather with you all! I appreciate your honesty and candor! Thank you Rick, I appreciate the follow! Chicago weather could change drastically, well, it is nothing compared to out here (mts I’m sure ) …anyway, so very interesting that you are a storm chaser…please tell us any stories that you have…thanks again for not using “I “or “me” 20 times in one paragraph…!!! (sorry) but I love your simple, straightforward, way of giving the weather. Hi Debbie, thanks for reading. I think a lot of people are enjoying a no-hype down-to-earth look at our weather. I mainly do it because I love studying and discussing weather, a lot of the news stations and websites like to sell advertising and need to hit ratings number so they like to exaggerate things a bit. Did you have one of the accurite stations? Which one did you have? They are generally pretty solid and haven’t heard of a lot of problems with them. If it’s relatively new, might be worth a call to see if they’ll fix or replace it. Otherwise it really depends on how much you want to spend and how accurate you want things. I use the Davis Vantage Vue, a little more expensive than the accurite stations but is wireless and provides very accurate data. It’s sort of the go-to for us low budget weather nerds that want accurate data but don’t want to spend thousands on weather stations. As far as storm chasing, yes I do it quite a bit. You will probably see more on my site in the next week or two as the season gets going. 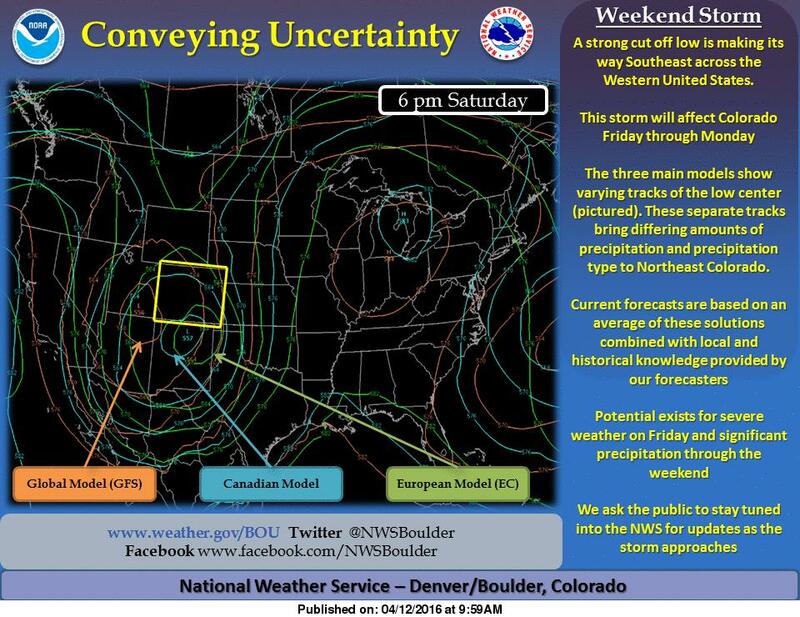 I will probably have my first chase on Friday or Saturday this week ahead of this storm. For spotting I always like getting reports from people in and around Castle Rock, whether its hail, snow measurements, rain, wind and pictures are always good too. You guys are in a great spot as I’m North of town and you’re South, there can be a lot of difference in what we see because of that. Dont’ be a stranger, feel free to send reports or pictures and I’ll get them up! Thanks again for following along, I always love to discuss weather so feel free to chat! I just discovered you, and love the way you describe the weather system and possibilities for us. I am in Parker. Thank you jacqui! Love that last name by the way! Yes, most fitting, however, i am ready for spring! I wish more people would understand that meteorology is a science and forecasting is hard to do~Mother Nature has a mind of her own, and she changes it often. My hubby maintains the Dopplar radar, and when I ask him about a forecast~he always tells me to, “check back tomorrow.” People become so irate when a forecast turns out to be different than what was forecasted; then they make rude remarks about the Weather Service. Thank you for explaining it to your readers. Yes, I think the biggest misconception is when a forecast comes out, that is exactly how things will happen. Weather is a constantly evolving mechanism, my forecast 6 hours later may be completely different than the initial one. Especially when it comes to modeling, this storm for instance could completely disappear from models once it comes on shore tonight… but that’s the fun part. If I knew exactly what every storm would do, I don’t think I’d find this nearly as much fun.